Thank you for the spotlight on “Knot My Sister’s Keeper” by Mary Marks and for being part of the book tour. Adore the cover and would love the opportunity to read the book. 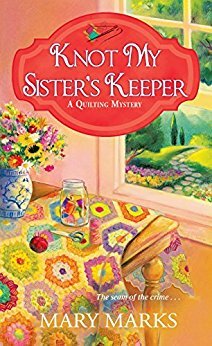 Thank you so much Brooke for spotlighting Knot My Sister’s Keeper in your blog today. And good luck to your readers in the book giveaway. This book would be enjoyable. Mary’s cozies are delightful and special. Thanks. This is a new series to me. Would really enjoy reading the book. Beautiful cover, and I love quilts as art. This is a new to me series. I would love to read. Such a pretty cover. I love the qulit on it.